Video shot in Mazatlan, Mexico. A common tactic that everyone uses when playing doubles is volleying to the middle between your opponents. And there are also certain instincts that just “happen” when hitting to that middle. Now, as you all know, all kinds of things happen when you’re at the net and you hit the ball down the middle in doubles. There can be confusion or indecision as to whose ball it is, is it yours or mine? And there’s that infamous situation where the volley goes between you and your partner and you end up staring at each other thinking… “I thought you had it!” “I thought you had it!” So hitting to the middle is an effective and powerful concept. Now this is nothing new…It’s the way it’s played. Good doubles players will volley and reflex it back two or three times in the middle until something happens. Sounds simple, and I can here you say, I knew that. But in a match situation, under pressure, do you do it? What’s your instinct? Do you stay in the middle or move back? Can you stay in the middle, and feel comfortable there expecting the next shot? So here’s the challenge… The next time you play doubles and you’re at the net, smack a volley down the middle, move into the middle, stay there and see what happens. Remember it’s quick, there’s no thought, it’s muscle memory. Let me know how you do! So to recap, when you’ve offensively volleyed into the middle, recover quickly, move to the middle and then move forward and close on the next volley. The middle is yours, expect it! Trust the physics and enjoy the journey. Thanks and good luck in your matches! This is a great video. Learning to compensate for your natural “instinct” is a great thought! Love your website! 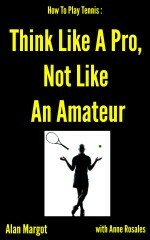 Great advice…will try this in my doubles match tomorrow!! SO TRUE about reflex and muscle memory…and nothing feels better than putting away the volley and dominating the net! 🙂 Thanks so much for your awesome website! Margaret, I’m so glad you like our doubles website. In your next match move to the middle, hit to the middle and stay there! Expect the next volley to be yours. It’s what you do! Great video. Love your website.